Watch in amazement as hundreds of images & colours featuring the Littlest Pet Shop family magically appear. 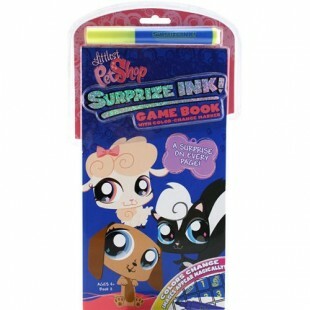 The Littlest Pet Shop Surprise Ink Game Book includes a special surprise ink marker. Color with the surprise ink pen and watch the images magically appear and your surprises are totally mess free too! There's a surprise on every page. The game book features all your favorite Pet Shop friends and is recommended for children over 3 years of age.